Wow, you had around 4,500 viewings of your featured article yesterday. It went from 0 earnings to $5.09 in one day. Apparently, people also visited some of your other articles, because your total income for the month went up about $7 just yesterday. Many people are cutting back on spending when jobs are lost or Social Security doesn’t stretch far enough to cover all the bills that arrive in the mail. After all, we have to eat and buy the medicine that we need. I want to show you some old-fashioned hints that might help cut your heating bills. Depending on where and in what type of housing you live in some of these tips will help. To accompany the article, eHow chose a trendy young woman inadequately clad. Gail thought the choice rather silly, but I’m sure they were trying to appeal to a young audience. As the winter weather grows colder and colder, you can learn to adjust the temperature lower and lower and your body will adjust too. Every few days set your heat a few degrees cooler. Each time you adjust the temperature lower, add more warm clothing, such as thermal underclothing, an extra pair of socks and warm sweatshirts. There are so many different seasonal sweatshirts that you probably have many already that will make you look great and feel comfy at the same time. I even keep an old throw pillow on the floor where I sit at the computer That helps keep my feet from the coldest part of my house, the floor. You will be surprised that you don’t need as much heat as you had thought. Just think of the savings! Check out the windows of your home. If you feel cold air coming in around your windows, you have a problem. You can stuff strips of old worn out socks around the cracks between the window and the frame. Cut the socks lengthwise and then cut into halves or fourths depending on the size of the cracks where the cold air comes in. It’s much cheaper than caulking and much easier to remove when spring comes. Use the rounded knife blade to push the material into the cracks. If your friends wonder at your new decorations, just tell them your windows have ruffles! Many older houses have problems with air seeping in under the doors. Use a throw rug, fold and tuck it across the bottom of the door. This helps especially at night when the outside temperature goes down and the wind is blowing a blue northern. On those cold, but sunny days, open the drapes and pull up your blinds and let the sunshine in. It’s free solar heating. on 12/25/2008 Very nice article. Very informative! GailM said on 12/1/2008, “Green Woman is correct. A doctor recommended wearing a stocking cap in bed to my father to keep his feet warm. Here’s another eHow article written by Gail Martin and rescued with the Wayback Machine. Writing family memories becomes more important over the years. Memories start to fade and the chance to save them grows slimmer. Here are memory triggers for the month of July. Use them to start writing down memories for your children and grandchildren to treasure. With our nation’s birthday on the fourth, try to recall how we celebrated the 4th of July as far back as we can. We used to go swimming and have a picnic. I can even remember when we had no fireworks, can you? What were your favorite fireworks? Our children loved smoke bombs and sparklers. How about some pet stories and the noise of the fireworks? If you recall picnics, tell about your menu and how you kept the food safe. Who attended? What were traditional picnic foods for your family? Where did you go for the picnics? Going to the movies cooled us off on summer days. What are your memories of Western movies? Our favorites were movies with Tom Mix, Dale & Roy Rogers, Gene Autry, and Hop-a-Long Cassidy in them. Where did you go to see the movies? Who did you go with and what did it cost to get in? Who could forget the smell of the popcorn? Describe the theater inside & out. Do you remember the first drive-in-movies? Did your theater have drawings or gifts? I found an old Log Cabin Syrup tin that looked like the ones I played with as a kid. Do you remember what syrup you liked on pancakes as a kid? Did your mother make them from scratch or use a mix? Write some breakfast stories. What would you do if you had as much rain as Kansas, Oklahoma, and Texas has had lately? Have you experienced torrential rains or flooding? Write about your rainy ordeals? Do you remember excessively hot summers? What did you do to cool off? The more you write, the more memories will flow into your mind. Try to write regularly. Every day is best, even if just a paragraph or two. 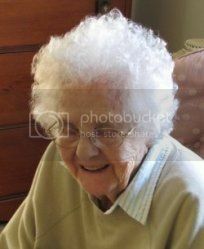 Me: There’s a lady on TV named Clara who has a cooking show called Depression Cooking with Clara (she’s 93 years old). Anyway, it’s a big hit. If you wrote an article about Depression Cooking (the kinds of meals to feed families on a budget) then it would come up when people are looking for Clara. Anyway, you would get lots of viewers (and maybe some money). We could put links to your articles on breaded tomatoes, and other recipes. Gail Lee Martin: Boy, I’m having trouble with this one. First I was only five when the banks went broke in 1929. Secondly, Daddy was working for Phillips by that time so he had a good job that furnished housing and gas heating and lighting. If Daddy lost any money from the bank closing I never heard of it. My folks had a milk cow, raised chickens, and a garden plus we gathered things that grew wild, even wild onions and garlic. We heard that some people ate possum and rattlesnakes but we never did. They did barter with neighbors and family that had other food that we could trade for with our eggs, milk, and butter. Now Clyde folks lost what money they had in the bank but his Dad had just paid cash for a new car as well as a new tractor, so there probably wasn’t too much money in the bank. Clyde remembers being told that Ren decided to raise Angora rabbits. Clyde just remembers the house that Ren built for the rabbits. Since the first four children were girls, Dorothy remembered working in the fields along with her Dad. Clyde’s brother, Ralph with the ducks. The Ren Martin farm in the 1930s. Both families keep eating as they always had, being self-sufficient. Worked hard and made do. I do remember Mother stretching canned stewed tomatoes by adding a jar of them to cooked macaroni. Her macaroni and cheese didn’t taste like ours does. Probably the difference in cheese. Rice was used as a cereal or pudding. We ate a lot of potato soup with onions cooked with the potatoes like Clara cooked hers. Mother would make a white sauce and add it as a thickening or made dumplings with flour, baking powder, salt and an egg. Then she dropped them by the spoonful on top of the potato soup covered with a lid and had a low fire until she thought they were done. She would never let me lift the lid for a peek. Me: Thanks, I may be able to put together something with this. You might want to elaborate on the family memories and put those on Our Echo. Gail Martin wrote this advice piece for the eHow website over 10 years ago. The car is getting old, but there’s no money in the budget to replace it. What do you do? Here’s our experience of how to keep that older car running so you don’t lose your mobility. Ours has over 200,000 miles on it now. Here’s their faithful old car that lasted for years. Ideally, you have some mechanical aptitude and can make repairs to the car yourself. This saves a bundle over taking it to a mechanic. My husband and son both taught themselves to fix most car problems we had. This is easier to do with an older car that doesn’t have lots of computerized parts in it. Clyde Martin kept the family cars going for many years. If you don’t have a friend who can show you how to fix things, look for a class through adult continuing education or a local community college. Something like a “powderpuff mechanic” or a “shade tree mechanic” course. Go to the public library and ask to see their auto repair manuals. Usually, the Mitchell manuals or Chilton manuals are in the reference section or they might have it on a computer. Copy or print out the pages that tell how to fix your car’s problem. Get the parts for the repair at the cheapest place, usually an auto salvage yard. If they don’t have the model or part you need in a junked car, then you’ll have to go to an auto parts store. If you are unable to fix the car yourself, find a mechanic. Try to build up a relationship with one place so there’s less chance they will try to take advantage of you. Usually, a small mechanic’s shop will charge less than an auto dealership. Tune up the vehicle regularly, so you don’t ruin it by letting it run out of oil or something else that’s preventable. Keep some emergency repair items in the trunk. I recommend having some cans of extra oil, a charger to jump start the engine, and an air compressor that you plug into the cigarette lighter to reinflate a flat tire. It’s also handy to have a rug to lay on if you need to get under the car and some rags to clean your hands after a fix-up. Don’t raise the car just with jacks and get under it. We knew someone who was crushed this way. This old-fashioned candy recipe is one my mother-in-law, Cora Martin, made back in the 1920s. It takes two people to pull the taffy after it’s cooked. You can even make a party of it. Here’s how to make it. Mix all the ingredients, except the vanilla in a pan (molasses, sugar, vinegar, butter). Bring it to a boil on the stove top. Boil for 10 minutes. Stir frequently. She always used a wooden spoon for this. Remove it from the burner and allow it to cool enough to be handled. Coat your hands with butter, then pull the taffy with each person holding an end. When the taffy becomes light in color, it has been pulled enough. Twist the candy, then cut it into small pieces. Cora and Ren Martin with their children in 1925. My folks had taffy pulling parties when my older sister, Melba, was in her teens. There was so much fun and laughter as we paired up to pull that yummy stuff. Then we cut the taffy into strips to eat. The pulling and the togetherness made this a wonderful winter treat. 1938 – Pauline Bolte, Melba McGhee, Twila Yeager, Gail McGhee and little Carol McGhee. What’s became of the old-fashioned watch party on New Year’s eve? Remember how we used to congregate at some neighbor’s home, eat pop-corn and apples (and sometimes drink sweet cider) until a midnight hour and then all join in singing a welcoming song as the new year opened before us? Some years when the cane was exceptionally good and there was an abundance of sorghum, we’d have taffy pulls. My, how good that taffy tasted, especially if it was seasoned with black walnuts! There’s another thing, too, that we remember in connection with the taffy pull, and that is how clean our hands would become after we had pulled and stretched our wad of candy (and had dropped it upon the floor a half dozen times) and had twined it around our fingers. No matter how dirty one’s hands were they always emerged from a taffy pull as white and clean as tho they had been given a scouring with Lewis lye. Here’s a slightly different recipe for cream taffy from a 1930s Kansas newspaper. They say to eat more fish. Fresh salmon can be expensive. Here’s an easy way to add fish to your menu plan without a lot of expense or trouble. These salmon patties are made very much like potato cakes. 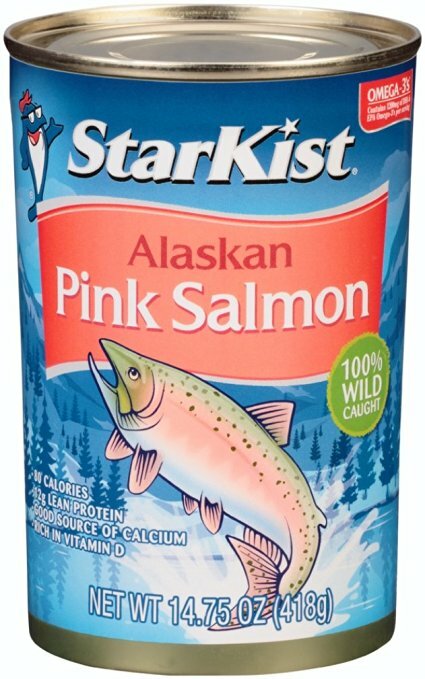 Put the canned salmon, including the bones, skin, and liquid, into a bowl. Stir it to separate and fluff it. Use a fork to crush the small bones that are in with it. Beat the two eggs with the fork, and mix them in with the salmon. Crush some crackers and mix with the salmon and egg mixture. The amount to add depends on how soupy it is. The crackers absorb the excess salmon broth and eggs. Once it thickens enough with the crackers, form it into patties. 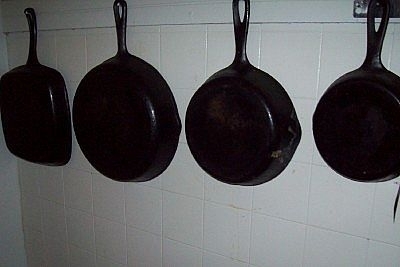 Heat up an iron skillet on the stove top so it’s sizzling. You can grease the skillet with a butter wrapper to use up the remnants of butter or margarine. It’s OK to use a cooking spray instead, but it won’t have the same flavor. Start the salmon patties or cakes to cooking in the skillet. Reduce the heat and cook until they brown on the one side. Turn them over and brown them on the other side. Keep canned salmon and a box of crackers in the pantry so you can make this at any time. You can substitute other kinds of canned fish for the salmon. Cod fish is available in cans. Be careful not to splatter yourself with hot grease when putting the cakes into the skillet. Parollins said on 3/12/2009 – My Mom makes these and now I do. I make them with potato pancakes and it’s the best. I add dill to mine too. Love this article. Wordstock said on 1/17/2009 – I love salmon patties, but didn’t know how to make them. Thanks! Cherst1031 said, on 9/5/2008 Thanks for the info on Salmon Patties, I have the ingredients, I just wasn’t sure how to make them. Now I will give it a try, sounds delicious and healthy! Vanillatte said on 9/5/2008 – Oh, Wow! I love salmon patties! Will have to make these soon. Great article! Nature provides free food that most people don’t slow down enough to even see. There are wild food and unpicked crops going to waste. Having grown up in the 1930s, we hate to see food being wasted. Here are our methods for using these wholesome and free foods in meals. Free Mushrooms – Maybe your grandmother gathered edible mushrooms and green plants that spring rains made plentiful. Even here in town, I can make our meals colorful and different by picking Inky Cap Mushrooms to add to soups, scrambled eggs, and gravy. The come up in the same spot in our yard after a rain. Wild Plants – I also pick Poke, Goose Weed, and Lamb’s Quarter and cook them like spinach. 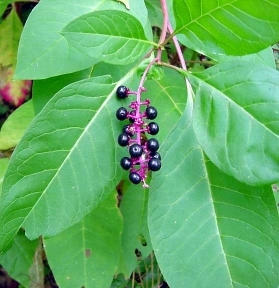 Don’t eat the beautiful poke berries as I understand the seed is poisonous. Just pick the leaves. 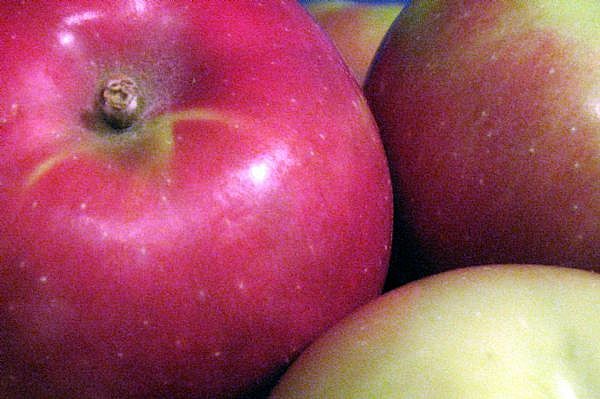 Free apples – When we drive around town or in the country, we watch for fruit trees that aren’t getting picked. Maybe the owner is elderly and can’t climb anymore or it might belong to a career person without the time or interest. I knock on the door or call the person and offer to pick their fruit for them on a fifty/fifty basis. Half for them and half for us, for our effort. Sometimes they say, just go ahead and take it all. Even fallen apples make great applesauce or get baked into pies. We return year after year with the same offer. Sometimes they even call us to say the tree is ready for picking. Nuts – The same technique works for getting free nuts. People often don’t want to be bothered gathering them. We would collect bushels of black walnuts which are quite laborious to hull, crack and pick out the nutmeats. The results are worth it. Some of the nuts we made into candied nuts for Christmas gifts and even sold them packed in decorative tins. Gooseberries – As a child, I went camping with my family near the river. We would gather mulberries and tart gooseberries. These made a good dessert when cooked together to go with the fish we caught and we never got tired of eating them. Lots of people use them for making pies. 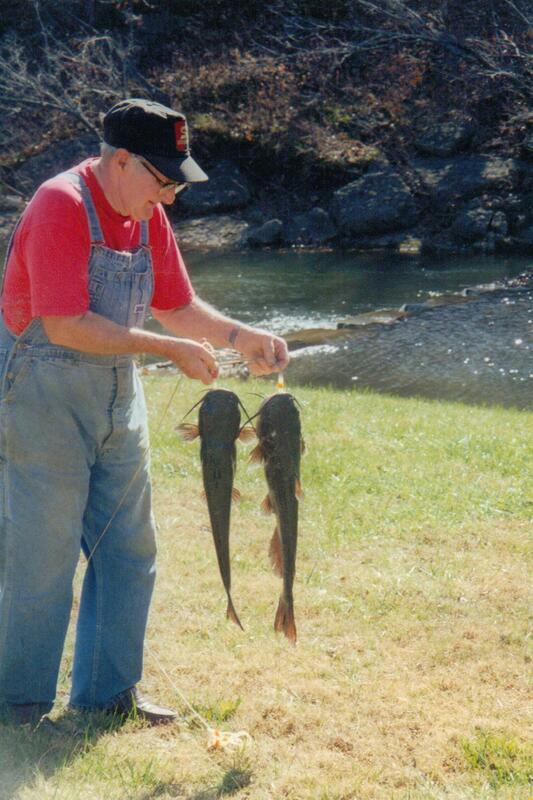 Catfish – I still love eating fried catfish. Mother always coated the fish fillets with flour and fried them in lard in our biggest iron skillet. Sometimes at night we would catch bullfrogs and their hind legs were good eating too. We mostly lived off the land as we had no refrigeration when we were at camp in those days. When I look back at those wonderful carefree days I don’t envy the fancy campers or motor homes. I’ll bet they don’t experience half the thrills that I had with my parents in those long ago summers on the Cottonwood River. 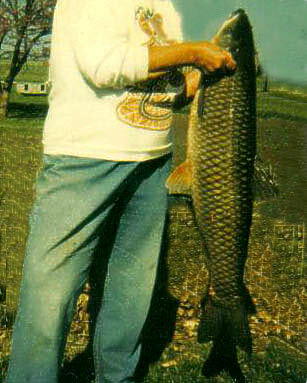 Carp – In our retirement, my husband and I fished a lot using a boat and also from the shore. One fish that others don’t keep is carp because the many bones made it impossible to eat. We found that we could pressure cook it in canning jars (bones and all). Then we use it like salmon for fish cakes. Always ask before gathering fruit or nuts from a tree in someone’s yard or farm. Even tart fruits like gooseberries or sand plums make good jellies. Don’t pick wild plants in areas that might be protected (like a park) or where chemicals are used (like near a golf course). Get positive identification on mushrooms before eating any. Some edible ones look very similar to poisonous ones.